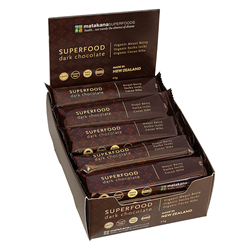 Matakana SuperFoods is bringing its Acai Bowl, Recovery Formula, Supergreens, Supershake and Superchoc blends, as well as its vegan SuperFoods Dark Chocolate Bar, to health and wellness e-commerce site Go4ItNutrition.com. Combining 70% premium dark Ghana chocolate with the goodness of three key superfoods and only 24% sugar our SuperFood Chocolate Bar is one of the healthiest and best-tasting chocolate bars available. Our SuperFood Dark Chocolate Bar is a deceiving snack. These vegan, dairy- and gluten-free bars contain organic ingredients that provide protein and antioxidants in a delicious way. Each bar contains 70 percent premium dark Ghana chocolate. The New Zealand-based producer of more than 70 lines of superfood products is continuing its ongoing expansion into the U.S. by distributing six of its products on major online retailers. Each superfood item is used to supplement diet, providing a daily boost of vitamins, minerals and phytonutrients. Glucina, who is a world leader in superfood nutrition, founded Matakana SuperFoods in 2009. Matakana became a leading wholefood provider in New Zealand by producing additive free, unique dietary supplements that taste great. Superfoods contain nutrient-rich wholefoods, such as organic kale, Moringa, blueberries, beans, nuts and sprouts. Superfoods are popularly used to provide benefits from keeping nutrients in an original form, as opposed to extracting individual vitamins, minerals and phytonutrients from various organic and synthetic sources. All Matakana SuperFoods items are sourced from organic and sustainable farms. The company’s lines include chia seeds, maqui, goji and acai berries, coconut sugar and fermented coconut sauces, and its Supergreens and Supershake blends. The Acai Bowl and Supergreens are the most popular products among these top sellers, followed by the vegan SuperFood Dark Chocolate Bar with organic maqui berries, sacha inchi and cacao nibs. Matakana SuperFoods products are free of artificial colors, flavors, additives, preservatives, cane sugar and GMOs.